Last year I saw a trailer for a documentary about a New York based nonagenarian known for her bold sense of style and clever one liners. Her name is Iris Apfel and she is the subject of one of Albert Maysles' last films. 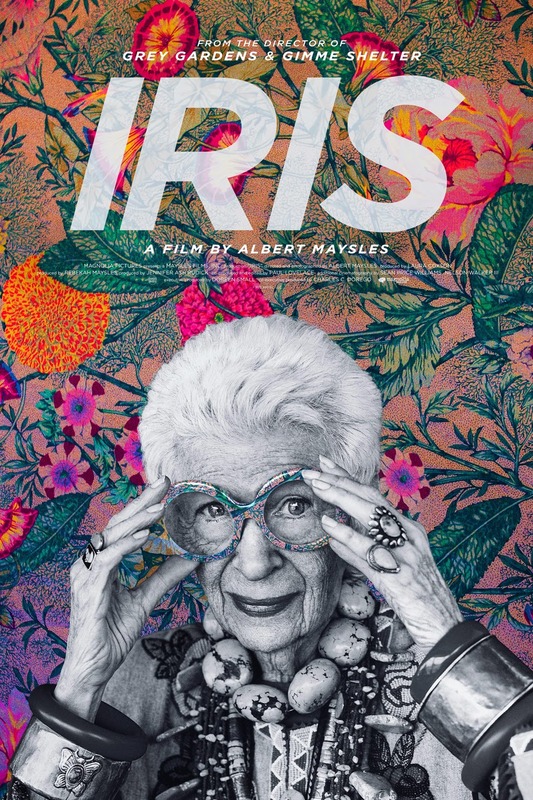 Now showing at the Film Forum, IRIS is a personal narrative of her fashionable life and loves told through her own words and pictures. Being immersed in the world of fashion, I had definitely heard of Apfel before, but I was soon to learn that there was so much more to her. That underneath the multiple large necklaces and layers of scarves was a truly extraordinary woman. The first thing that you discover about Apfel is that she is funny. Funny and extremely witty. At 93 years old she has had and continues to lead an interesting life by embracing her uniqueness and channelling her creativity into her work. Apfel has been an interior designer, ran a successful textile company, and a passionate shopper. In IRIS, as you watch her sort through flea markets and haggle for a better price, you clearly see that she takes both pleasure and solace in the activity. Having spent a lifetime traveling the world, Apfel has amassed a sizable collection of clothing, home goods, and jewelry housed in multiple homes and a storage loft. To say that her collection is large is a gross understatement. It's one of those things you have to see to believe. IRIS is so many things. A devoted wife, a consummate businesswoman, but I think the most interesting thing about her is that she is brave and unafraid. Apfel has had the audacity to live a life true to herself. One of individuality and eccentricities where you wear round eyeglasses everyday and more is always better. For nearly a century, she has dressed in a style that is uniquely hers whilst inspiring many people along the way. In 2005, The Metropolitan Museum of Art honored her with a retrospective entitled "Rara Avis: The Irreverent Iris Apfel." A rare bird indeed.